We were instructed by our Client to manage and deliver the internal refurbishment of seven commercial retail units situated in a converted riverside warehouse within Chelsea. 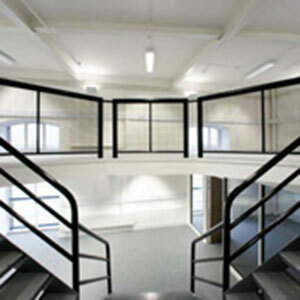 Complete refurbishment of the units was undertaken to provide a modern attractive commercial office environment. The refurbishment was completed within budget and on programme. Following the successful completion of this project, William Martin were instructed to undertake the refurbishment of a further six commercial units. This second phase of work involved the design and installation ofamezzanine within one unit which not only enhanced its appearance but also increased the net lettable floor area by over 125 square metres. We were also involved in the combining of two smaller commercial units to provide a more attractive larger open plan work space. For these works a close working relationship was importantwith both the existing tenants and structural engineer to ensure the works were successfully completed with minimal disruption to other users.